You're on vacation, and you urgently need to get a sandwich in you. Wouldn't it be nice if Google Maps would filter out the noise? You really just want the map to show you nearby sandwich shops and how long it will take to get there. 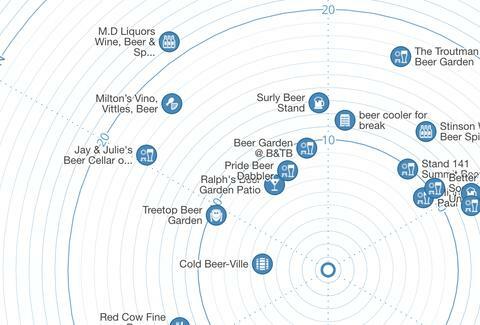 In a way, this has occurred to designer and software engineer Peter Liu, who has created a map that shows temporal relations to buildings in your vicinity. 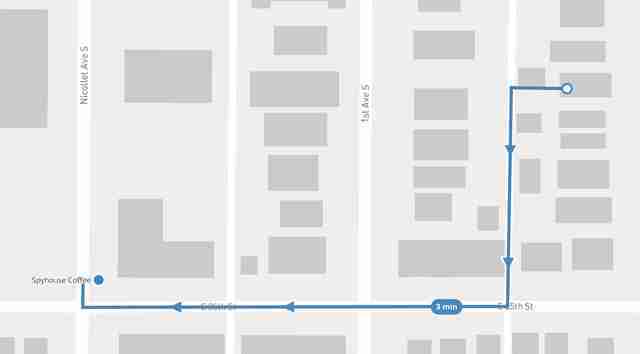 The Time Map shows search results and how long it will take you to get there by foot, bike, or car. Liu says he saw something strange with how we talk about a morning commute. "If you’re like most people, it starts with a ballpark estimate of how long it usually takes," he wrote. "There’s something strange here: we’re answering a question about a trip through physical space, with numbers in units of time." “I thought, we’re using distance as an imprecise and poor proxy for travel time,” Liu told Co.Design. “Why not cut to the chase and visualize travel time?” Liu studied many maps that use time as a measure of distance for inspiration. He settled on concentric circles that focus on time, but also give the relative direction based on your location. The map provides an aesthetically appealing way to look at the world. It also provides knowledge on how to get coffee as fast as possible. 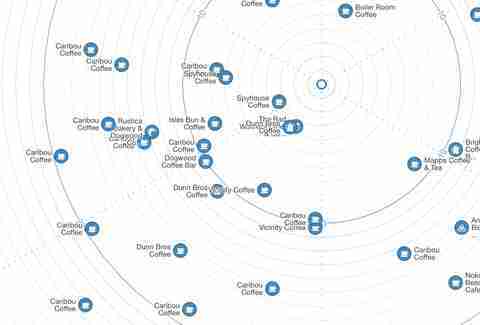 Once you pick a location, say Minneapolis's Spyhouse Coffee in the example above, the map changes to a more traditional format and provides directions. It's not just an exercise in cartography, it's actually a useful tool. It's useful for making decisions on where to lug your weary bones when time is of the essence. However, it's still early in its development. Liu hopes to make a full app from the technology and to make it available to Mapbox clients for use in their own apps. Hopefully, it will incorporate an SOS feature down the line, so when you realize you're 25 minutes from the nearest banh mi you can click a button to send for help. Dustin Nelson is a News Writer with Thrillist. Help. He needs a sandwich. Send help. Follow him @dlukenelson.